← Truth doesn’t come in e-mails with lots of exclamation marks! 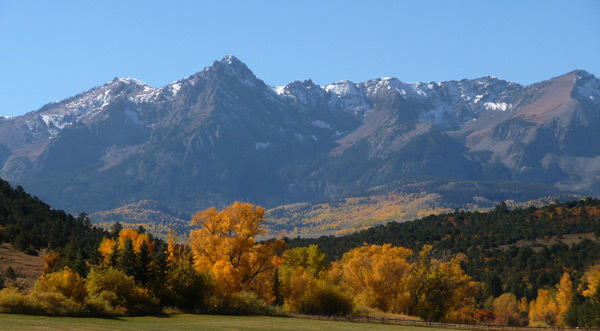 We've had a prolonged fall color season this year. These pictures were taken October 15, 2010, well after when the leaves should all be on the ground! What happened to the calendar? No one seems to be turning the pages! All the leaves should be on the ground by now—everyone knows that! And yet they linger on. This is the first season since we’ve lived here that all the leaves are turning color at once, regardless of species, whether bush or tree. Last Friday I hopped on my trusty XT-250 and did a grand tour of CR 5, 7, and 9. This post shows a small sample of the pictures I took along Ouray County (Colorado) Road 9, which winds from CO Hwy 62 at the north, down toward the base of Mt. Sneffels(see here for GPS track in an earlier post). It’s some of Colorado’s most scenic country. I point out that the road itself is pretty passable, although there’s a big mudhole toward the south end. The only way around it is through it. I'll just keep adding these to the post. The color is stunning! To be completely open, it was a bit of a hazy day, so I did some corrections in Adobe Photoshop Elements 6 to take away some of the haze. I think the result accurately reflects what I saw. The camera, my Lumix DMC-TZ4, is a point-and-shoot, so I can’t use a polarizing filter like I’d wish. But the Pentax is too big to take on the bike, especially when I know I’ll be transiting mudholes and fording creeks! I thought I'd taken a couple hundred pictures, but when I counted them I had only 101. The only people I ran into along CR 9 were some hunters who had already set up camp as far south as the road goes. They were ready to gun for elk and were confident they’d find some. We’ve had a prolonged Indian summer and the temps are comfortable in the afternoon, but at night it dips way down—below freezing at this altitude. Every turn offered more. 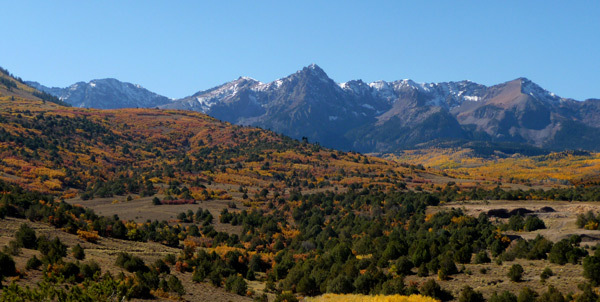 The aspens, the scrub oak, the trees down by the creek. Everything! That's Mt. Sneffels to the left of center. Fall is my favorite time of year, but the color season usually lasts only a week or so. This year it’s been a month! I’m way behind getting things posted. County Road 9 cuts through the Double-R-L ranch, which is Ralph Lauren's property. Stunning scenery! That's Mt. Sneffels to the right of center. One last glimpse from CR 9 before moving on to CR 7. 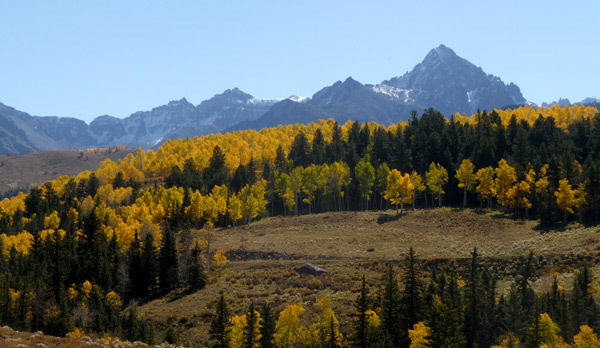 This entry was posted in Fall Color, Ouray County. Bookmark the permalink. my 1st trip out West was 1951, I lived in and worked at the Beaumont hotel in Ouray Colorado, also the hard rock mind above town, I was 17, I have been back several times, last trip 2007. I find it one of the most beautiful places on earth. Calvin, welcome to the area! To answer your question, no, there is no single place to park. The wife and I are going to be parked at Ridgway State Park last week of September. We will be trailering our ATV’s over to ride Co. 5, 7, & 9. Can you access all three roads from a common loading area off hwy 62? It has been several years since I was in the area in a Jeep but have not ridden our ATV’s in this area. 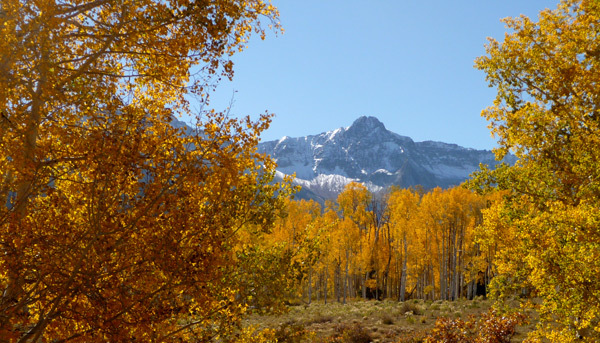 It is such a beautiful area to see the Aspens change. Any information would be much appreciated..
Tom, it’s hard to say. All three roads can become rutted. All have rough sections. I wouldn’t recommend a family car. You can rent Jeeps in Ouray—there are several places that rent them. See http://www.ouraycolorado.com/Jeeping, down at the bottom of the page where they list various rental companies. Costs vary from company to company. 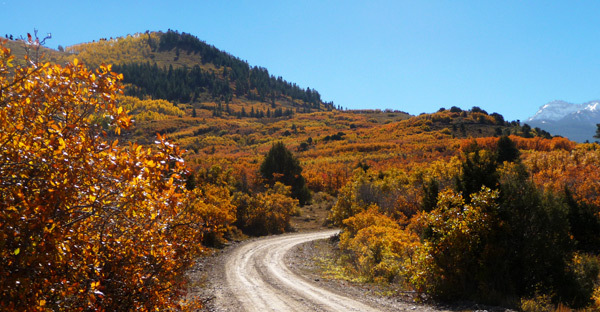 If you do rent a Jeep, be sure to also tour Last Dollar Road, which has some of the most spectacular fall color around. 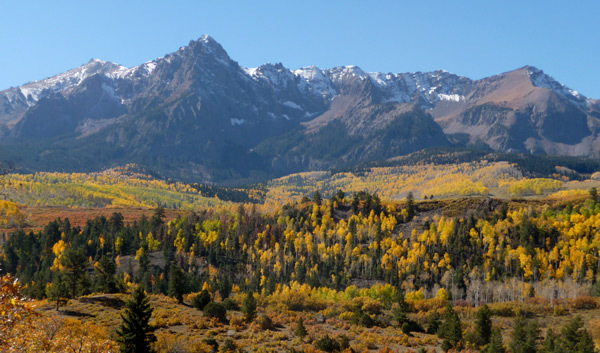 Usually our fall color season is peaking around the last week in September, although the colors along Red Mountain Pass seem to peak about a week earlier than those along Lizard Head Pass. This season has been unusual because of the abnormally large amount of snowfall and a very wet summer, so the season may vary. How far in can a person drive a family car? Would like to drive furtherest point of car road. Would like to see county roads CR 5, CR 7 and CR 9 in my car in September, is this doable? If not who expensive is 4wheel rental in Ridgway or Ouray? ?